I am so excited that our Move & Learn series is BACK! If you're new to Toddler Approved then you can read more about this series here. For our Move and Learn Series I am joining with Hands On: As We Grow, The Pleasantest Thing, and Coffee Cups and Crayons to share some awesome (and active) learning ideas with you! 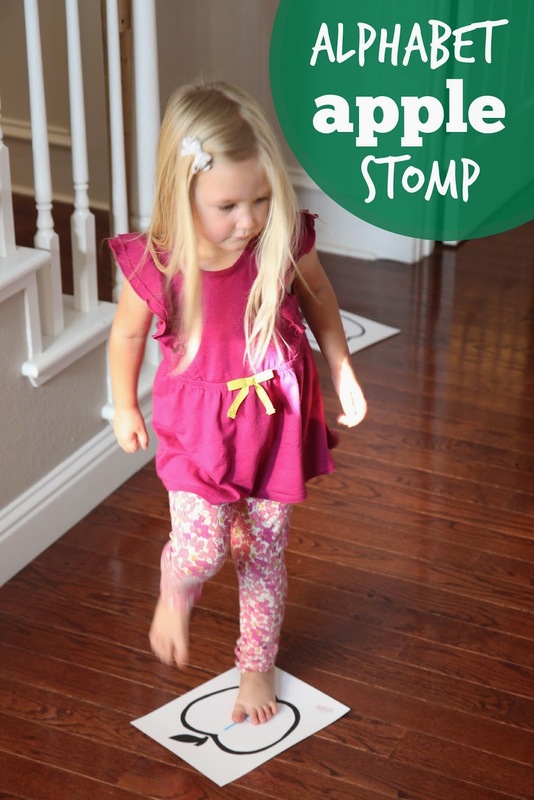 This week Move & Learn is all focused on the alphabet and we are having Apple Week here on the blog so in keeping with the theme we did a super simple Alphabet Apple Stomp Game! To start off this activity you are going to want to download our really simple apple printable. Print out the apple printable onto several pages. I printed out 10 copies since my daughter's name has 5 letters in it and I wanted lowercase and uppercase apples for her name. Next, write one alphabet letter on each apple. You can either just do all lowercase letters or do uppercase or do both. I did both. We focused on the letters c,a,t,i,e and C,A,T,I,E. Once they are all written out, tape the pages to your floor. Make sure to spread them out! You could also turn this into a throwing game and stick them on the wall instead. To start I wrote my daughter's name on a piece of paper. Names are really important to kids and are the letters in their names are my favorite letters to focus on with my kids. We like to talk about the letter sounds and the letter names. To play our game I would point to a letter in my daughter's name and she would try and tell it to me- either the sound or the letter name. Once she said it then she had to hunt around the room and find the lowercase and uppercase alphabet letter and STOMP on them! My toddler had fun following my preschool daughter around and stomping too. After we played this game for awhile my 1st grader came down and wanted me to make him a version of the game... so we worked on proper nouns and common nouns. I would say a noun and he had to decide if it needed to be capitalized or not. He loved the challenge! You could also use this for a variety of other skills- working on sight words, practicing number recognition, or even doing math facts! Instead of using the alphabet letters, color the apples different colors or print them on different pieces of paper. Having your toddler try and find two apples that match colors. Need more activities for toddlers or preschoolers? Make sure to check out our awesome e-books! 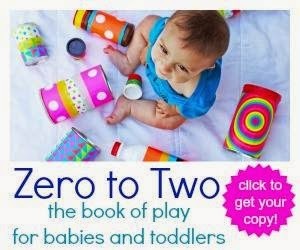 Zero to Two: The Book of Play is full of wonderful sensory, play-based ideas for our youngest learners. It comes with a set of printable puppets and stroller cards, and is just right for babies and toddlers. See more details of the book here and buy it now for just $8.99. 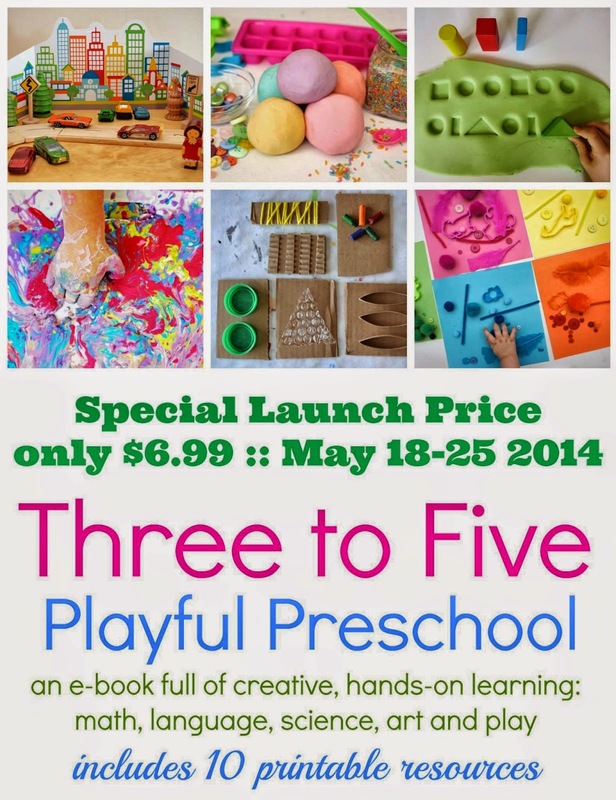 Three to Five: Playful Preschool is packed with hands-on, creative ideas, including math, literacy, science, art and play. It comes with ten fantastic printables including My First Journal, a city-scene for pretend play, recipe card, and math and alphabet game cards. See more details of the book here and buy it now for just $8.99. You can buy the ebooks wherever you are in the world. You pay via PayPal.